The phrases “civic duty” and “service to our country” are often used in the same sentence, and refer almost exclusively to the significance of the military or voting. While military service is a vital form of public duty, and voting is truly a pillar of democracy, serving the country doesn’t necessarily mean enlisting. In reality, almost every cause has some aspect of service that is a form of civil duty. While an overarchingly important aspect in many governments around the world, civic duty holds a special place in many Americans’ hearts. Here in the United States, it can take on a whole host of forms, from volunteering to running for office. No matter which role citizens elect to partake in, each aspect plays a key part in the functionality and overall success of the country. What Is Civic Duty And Why Does It Matter? Civic duty means something different to each and every citizen of the United States. For example, “the utmost civic duty is to do for your community what you want your community to do for you… [it] is about how you can contribute in some way, at whatever level, to helping your neighbors. Civic duty is also your obligations to your community,” said Civics and AP Government teacher, Trevor Duval. As a civics and government teacher, Duval is responsible for the education of many juniors in everything associated with being a citizen. To him, the class is about more than just government; it’s about the people. People make up every aspect of the country- people run the government, people are in charge of voting, people are responsible for making sure what the collective cares about isn’t ignored, and people are accountable for their actions. In a way, Duval’s perspective on civics sums up what civic duty is and what it means to the nation. It’s about helping others – about service. It is the embodiment of the question “what can I do for my community and what can I do that will benefit others?” Whether your cause is providing safe, drinkable water for everyone, or sledding safety at the local hill, if your end goal in some way helps or benefits the community, it is a fulfillment of public duty. “By engaging in civic responsibility, citizens ensure and uphold certain democratic values written in the United States Constitution and the Bill of Rights,” said Jennifer Self in an article for Learning to Give. The theory behind democracy was established around the idea of involvement and the voice of the voters. That’s where the idea of civic engagement ties in: by being a part of the community, and really the country, citizens are able to make their values clear and protect those ideals of equality, justice, and freedom for all. In fact, one could argue that the building blocks of democracy, such as Locke’s theories of popular sovereignty and the consent of the governed, pertain to civic duty as well. Consent of the governed suggests that a government has no right to wield its power without approval from the citizens. Meanwhile, popular sovereignty is a philosophy which espouses that the citizens ultimately rule. “Popular sovereignty, one of the core foundations of the Constitution and our country, is all about ‘we the people,’” said Katie Henderson, Civics and Human Geography teacher. The main commonality between the two is that they give power to the people. Yet, with power comes responsibility, again leaving it up to the general population make sure their values are represented, reaffirming the importance of civic duty. Despite the obvious importance of community engagement and protecting the democracy Americans love dearly, not everyone participates. “[T]he US, if you look globally, is not necessarily the most actively-involved electorate. There are a lot of people who don’t vote…. Is [mediocre voter turnout] because people are apathetic and don’t really care, is it because people think their vote doesn’t really count? But whatever it is, I think that part of our role in government should be to figure out ways for more people to be involved,” said Henderson. Maybe those who elect to forgo their civic duty do not feel their voice can help change anything, or maybe they just don’t have time. That is part of the beauty of our democracy: civil participation is not mandatory. Instead, it is up to each and every citizen to be responsible for their own actions and help the community. Regardless, civic duty is still a quintessential part of modern life. One of the most basic ways to be involved with the community and government is voting. “Voting matters… you should always pay attention to what’s going on with your current government. And if you don’t like what’s going on, you should vote to change it. Otherwise, you lose your voice and you can’t really complain about it later,” said a proud Brookline voter. Especially in New Hampshire, registering to vote is easy. There are only three requirements: you must be 18 years old, you must be a US citizen, and you must be a resident of New Hampshire. Bring documents that prove age, citizenship, and residence to the town clerk’s office, and you can register to vote in no time! In fact, NH even has same day voter registration for further convenience. Although voting may seem simple, it is essential that voters actually know what and who they are voting for. Understanding the policies presented on the different questions, and exactly what a candidate stands for is extremely important. “Do your research. There is nothing worse than going into the polls with no idea what you are going to vote on. It’s not hard to find the information [about the different candidates]. Get the information, get it to your friends, but understand what you are going to vote for…So it’s important to know ahead of time so when you walk in there, you’re not confused and just picking,” said Rob Rushton, Brookline resident. Being informed in general is a key aspect of civic duty. However, its consequence skyrockets once it comes time to vote. Just like any other decision, you have to understand what you are supporting. Solely sticking to partisan lines without doing the research because it’s easier is not a civically responsible option. You should know who you are dubbing judge of what’s best for you. To help you figure out exactly who and what you are being asked to weigh in on, there are plenty of websites dedicated to delivering unbiased and extensive reports on both state and national legislators as well as with their voting records. “It’s important to let your voice be heard. The whole cornerstone of our democracy is about participation in elections…Young people are very much so underrepresented in electoral politics and it’s really vital that their voice be heard… everyone’s voice deserves to be heard,” said Teagan Hudzik ‘19. Voting is a baseline of civil participation. It is just one of the many ways citizens can voice their opinions, but it is also one of the most vital. By voting, Americans are electing into office those who represent their personal values. While calling the senator’s office each time you wish to let your opinion be heard is effective, voting in someone you believe has the same goals, and is more efficient and convenient. So remember to vote! That said, there are an abundance of causes that can help you engage in the community for the benefit of others, regardless of age. “Even though you are not able to vote, young people are so important in our country and in our world,” said Henderson. For example, students can volunteer for campaigns, obey the law, call or email their representatives, volunteer for other organization which benefit the greater society, stay well informed, encourage others to do good for the community, and even do their best in school. 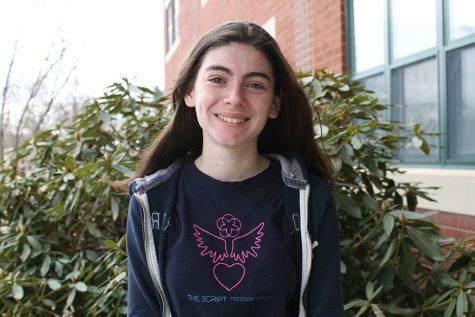 One example of a student taking on their civic responsibility is Hudzik, who campaigned to be a write-in for this year’s New Hampshire state elections. 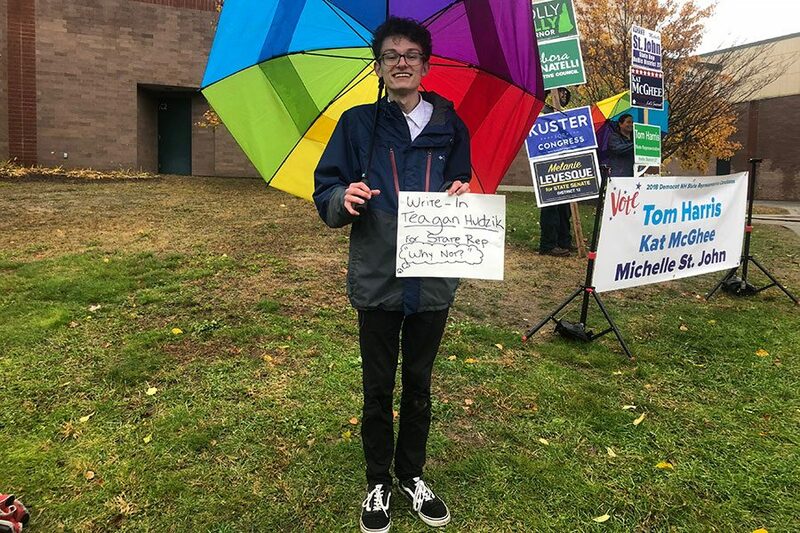 “I see a lot of problems in the community and in the state as a whole, and as a college student- soon to be college student- I have a vested interest making sure that myself and others in New Hampshire have access to affordable education,” said Hudzik, while standing outside of Hollis Brookline High School on November 6, election day. While talking about the importance of having your voice heard, he not only mentioned voting, but peaceful protests and contacting representatives as well. Although a lot of civic duty revolves around politics, if you are not a fan of today’s perpetual political showdown, you can still fulfill your public duty by engaging in activities that benefit the community. Volunteering at the Nashua Soup Kitchen or with the some of the various school clubs is an easy, not-at-all political way to make a difference in someone else’s life and in the community. After all, “[i]t’s really important to… find out what’s going on in your country and be a part of it…You need to make the world the place that you want to live in. You have to imagine what a perfect world would look like and then work to make that happen,” said Brian Rater, former candidate for New Hampshire State House of Representatives. In the end, participation is a quintessential part of the foundation of America, so help keep democracy alive and step up in your community.